Offset in association with Absolut are leading up to Offset 2014 (below) with events, exhibitions and collaborations all over Dublin. Edible feasts from Designgoat, a series of talks in the Science Gallery, collaborations with Panti (pictured above) and heaps more, find out how Dublin will is being transformed here. Ireland's leading creative festival returns for three days jam-packed with inspirational speakers from across a range of disciplines from Ireland and all over the world. It's a fab event and tickets are still available at fab early bird prices. Dublin-based designer Annie Atkins might just have gotten herself the dream job: creating all the graphic props for Wes Anderson's latest film, The Grand Budapest Hotel. See some of the props and graphics Atkins created for the project at Lighthouse Cinema. As the film is set in a fictional state in the past, ths meant creating a massive amount of ephemera, even down to postage stamps, money and newspapers. Details of the exhibition are here, while you can read an interview with Atkins over on Creative Review. An exhibition and lecture series at the Irish Architectural Archive, Dublin Shops stems from a personal project by architectural photographer Paul Tierney. 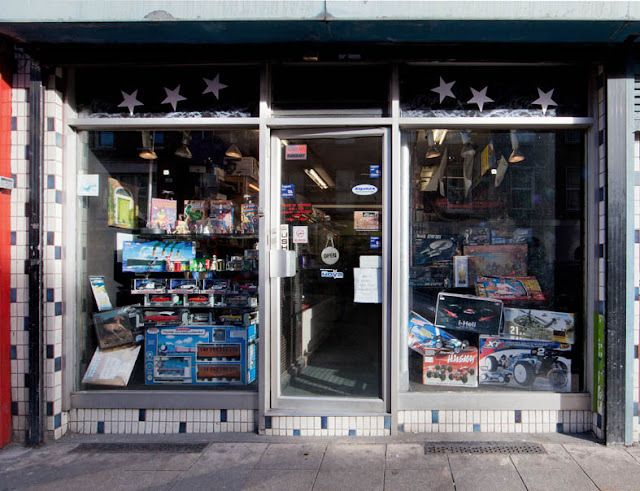 Tierney wanted to record the beguiling shopfronts of Dublin's depleting independent shops (one pictured below), showing the simplicity and symmetry of their facades, but also their stuffed, almost overwhelming window displays. The exhibition is free to attend, as are the accompanying talks. Science Gallery describes this exhibition which takes its name from the wise words of Samuel Beckett as an exhibition of 'beautiful, heroic and instructive failures', opening up a debate on the role of failure in stimulating creativity: in learning, science, engineering and design. 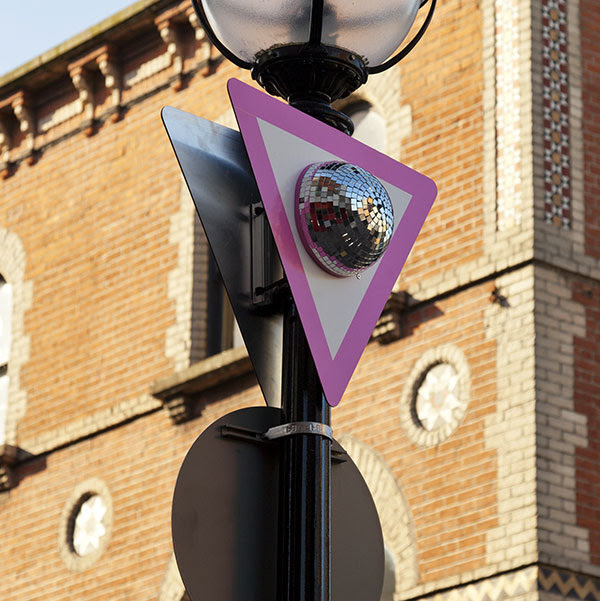 The first Irish exhibition of British artist Haroon Mirza's work, Are jee be? sees Mirza continue his penchant for combining the ready-made with time-based materials to create audio works of art. What's interesting about this particular exhibition is that the ready-made in this case is IMMA's last major exhibition exploring the work of Irish architect and designer Eileen Gray. Remnants of the Eileen Gray show are 'remixed' to create something new and unique. The exhibition's also accompanied by a 90s club night, showing that Ireland's finally getting in on the UK's habit for Friday Lates. The story of Jane Drew is one that's all too common in the world of architecture (indeed in most sectors): a talented and visionary architect who got way less attention and credit than her male contemporaries. Sigh. Responsible for a lot of great mid-century architecture in London, a number of Britain's new towns and even internationally, she valued the close relationship between architecture and art and was responsible for the procurement and redesign of both of the Institute of Contemporary Arts' premises. Admission to this show is free with ICA membership (you can get day membership for £1, giving you access to the unticketed exhibitions, cafe, bookshop and wifi). 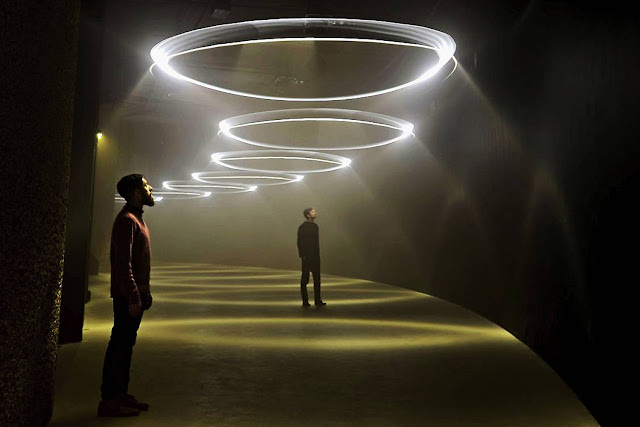 I attended Offset in 2012 and one of the many amazing talks I heard was by Ash Nehru of United Visual Artists, a practice who combine light, engineering, sculpture and performance to incredible effect. They have produced Momentum, a piece/installation/experience specifically for the Curve in the Barbican. I haven't seen it in the flesh yet but am really looking forward to it. The nominees for Designs of the Year were announced a couple of weeks ago. It spans a host of design disciplines and includes a floating school in Nigeria, a Lego calendar, Hella Jongerius' interiors for the UN, Citymapper (I could not survive in London without it) and heaps more. The nominees will be exhibited at the Design Museum and both a Visitor Vote and an online Social Vote will give you the chance to fly the flag for your favourites. I can't wait to see the exhibition, about which the Design Museum says, "someday the other museums will be showing this stuff".